I’m back from a wonderful trip to the Hanksville Dinosaur Quarry in Hanskville, Utah. This excursion is led by the Burpee Museum of Rockford, Illinois, a spectacular regional Natural History Museum known for its top notch research collections and amazing exhibits. I’ll talk about the day to day activities, and how we find and extract fossils in quarries. The day started at 8 am with a delicious breakfast prepared by the local restaurant, Blondies. We then headed back to basecamp to get all of our gear for the day, fill up the coolers with ice water and lunches, and head in to the quarry. It was about a 20-minute drive to get there, mostly on a county road with amazing rock exposures. By the time we got to the quarry, temperatures would be reaching the high 90s°F. We would work until around 12:30, and break for lunch under the break tent. We worked until around 3:30 when temperatures peaked (highest was about 104°F) and a break was needed. You can see the blue tent behind the cars. Work continued until 5 or 5:30, then we packed up and headed to the base for showers, dinner, and an evening activity. 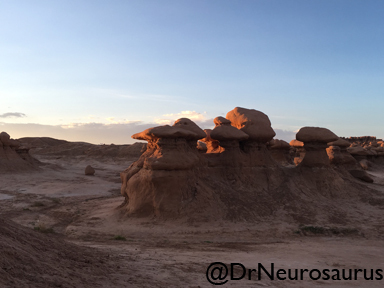 Sometimes that was checking out a state park, like Goblin Valley State Park. Sometimes we’d wait until dark and go look at the stars. Extracting fossils from a quarry is not something I had done before. They used these tools called an ME-910, which is basically a mini-jackhammer. It hammers away the rock little by little so you can find hidden bone and safely remove the rock around it. Once the fossil is found, we take away the rock around it, leaving it on a little pedestal of rock. We don’t ever want to completely remove the bone from the rock because the bone can easily break. Leaving it encased in rock keeps it stable until we can get it back to a museum for further preparation. Next, the bone (a dinosaur chevron) is ready for plaster! I love this part because it’s like an arts and crafts project. First you cover the bone in wet paper towels to protect it from the plaster. Then it gets a layer of tin foil. Then we use burlap and plaster to cover it up. 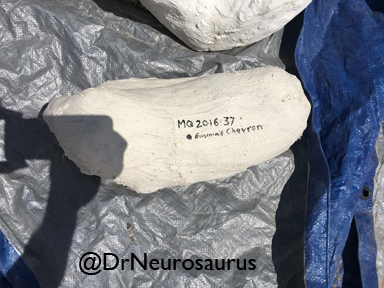 The plaster jacket gets a field number and label, and is mapped in the quarry so the collections manager can know exactly where in the rock that bone came from. 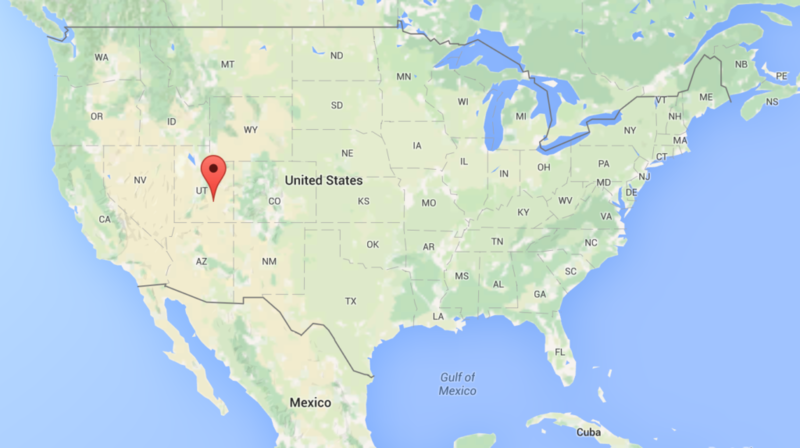 Mapping the location of the bone. Finished jacket with field number. Next time I’ll talk about how we prospect (look for fossils in new places), about the wildlife we saw, and I’ll share some photos of the amazing geology. What’s ‘The Field’? It’s where paleontologists go to look for fossils. We call it Field Work, hence ‘going to the field’, and it can take place anywhere we travel to look for fossils. This year I was invited to join the crew from the Burpee Museum (in Illinois) to their field site in Hanksville, Utah. I’ve been fossil hunting before, to the Petrified Forest of Arizona (Late Triassic sediments), and to the Gobi Desert of Mongolia (Cretaceous sediments). 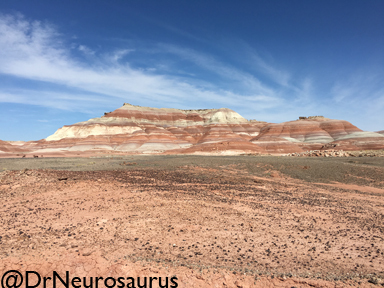 I’m really excited to be able to go to a new place (Utah) and a new time (Jurassic sediments) and hopefully interact with animals that died millions of years ago. 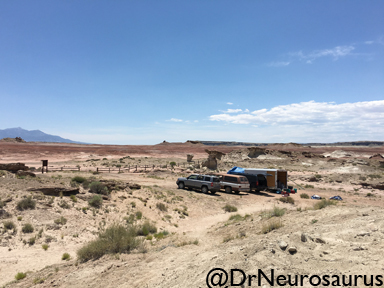 I’m joining the crew for their last week in the field, so the goals of the trip are to hopefully find some new fossils, but mostly help them finish jacketing big fossil, loading them in to the cars, and packing up the gear they brought out there. 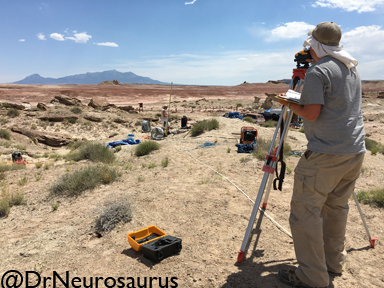 As an early career paleontologist, I have some field equipment, but not everything I need, so I’ll tell you what’s mine and what I’m borrowing from a friend. Firstly, housing. 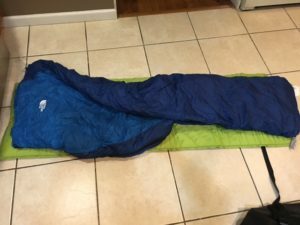 I’ll be sleeping in a tent (mine), with a sleeping pad (mine) and sleeping bag (borrowed). 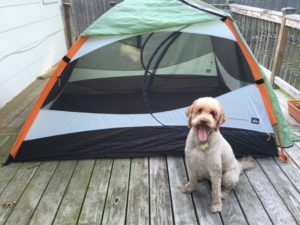 My tent, with my fabulous dog model, Maia. I’ll be bringing a first aid kit (mine), sun screen, and bug spray, because it’s important to be prepared. 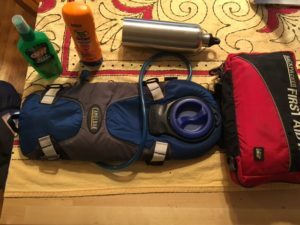 Spending a lot of time in the sun means dehydration, so to avoid that, I have an insulated 3 liter camelback, and a 1 liter Sigg bottle. I usually drink about 4 liters while I’m in the field and more back at camp. In terms of tools, I’m bringing my rock hammer, hand lens, 3 empty film containers (for small fossils), 1 small brush, a headlamp, a multitool, and a knife (all mine). The only camera I’m bringing is my cell phone. 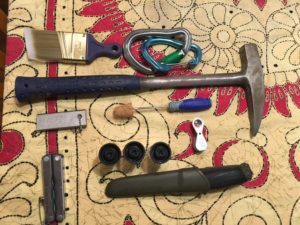 Tools from top left to bottom right: brush, carabiners, rock hammer, fire starter, awl, multitool, empty film containers, hand lens, and knife. In addition, I have an assortment of clothes, 2 hats, a dinosaur bandana I’ve had since elementary school, boots, and a football (all mine). The sun stays up a long time in the summer, it’s fun to have something to do back at camp. Next week, I’ll talk about the trip, the fossils we saw, the day to day around camp, and other fun things, so make sure to check back in! 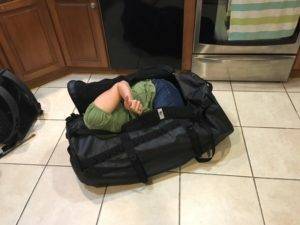 I’m all packed! See you next week!